If you have the 2 alternative dates, you have to find the cafe-bar, the place that will host your party. As I said above, you should have 2 alternative dates, so when you ask them if they’re OK to host your party and they refuse, you can propose them the second date. The location of the place should be at the center of your city (unless there’s a special place at the suburbs). If people from outside your city want to join the party, it’s easier for them to reach the place. Regarding the place, if you think that you can make deals for better prices of the drinks, it’s up to you. It’s not your concern what they will order. It’s best if the place serves coffee, beer, soft drinks. If someone is hungry, there should be soft food. Finally, background music is OK.
* Your first task is to create a poster for the party. Be creative. Try to make the poster funny. The information you should have is TITLE/DATE/TIME/LOCATION (address)/CONTACT (mail or phone number). Regarding the location, if it’s easy for you, put a QR code, so they can see it on maps. Try to find a proper hashtag to use for facebook, google plus and twitter. * Write a blog post at community’s blog and ask members of your community to take the text-pictures and write a post at their blogs (preferably different days). If those blogs are registered to planets, many people will read about your party. * If your community-project has a global place where to add your party, go and add it. 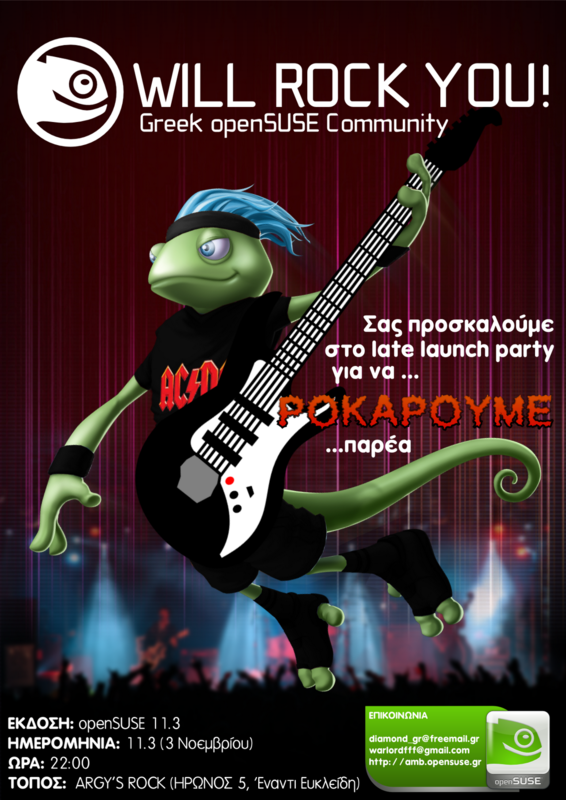 See some examples at openSUSE or GNOME. * Create a facebook event and invite as many people as you can. Remember, less than 1/3 that replied yes, will finally come. * Create a google plus event and invite also as many people as you can. Ask people to invite their friends. * Tweet your facebook and google plus events and encourage members of your community to retweet. Also try to tweet regularly about your release party. Don’t forget to use the hashtags. * Send mails to ALL mailing lists about your party (text, poster and social media event pages). Send mails to all distros-GUIs-projects mailing lists. Although there are other channels the users can learn about your release party, you want them to join and celebrate with you, so they don’t have excuse that you didn’t invite them. * Post to forums about your party (text, poster and social media event pages). Don’t forget to add the option to receive a notification if someone reply, asking questions. Again try to do the same. Post it to ALL distros-GUIs-projects forums, so they’ll celebrate with you. Although it’s not necessary to have a cake (because it costs), it’s sweet to have one. Order it from your favorite patisserie. Ask-order them to print the logo of your project on the cake. Also choose your favorite flavor of the cake. According to my experience a 2kgr cake is OK for most parties. In my country costs about 30Euros. Since we’re volunteers and we’re doing our “hobby”, we pay for the cake. If the team has more than one person, it’s easier to cover the amount. If there’s only one person it’s normal if he/she doesn’t have a cake. When you’re going to get the cake, ask them if they have candles (if it’s not similar to the version number of your project, 1 candle is OK). Also buy from a market, plastic plates and forks/spoons. You’re going to use plastic plates to serve the cake. Bring one or more cameras to take pictures or videos. Those pictures will be used for reports (blog posts), upload them to your facebook-google plus groups. Also ask everyone that brought his/her own camera to upload the pictures to your groups or send them directly to you, so you upload them to public place. Don’t forget to take the family picture. Also remember to make people laugh. After the “serious” picture, ask them to give you their silly face. We’re bored being serious. I mentioned above that you should gather the people to talk for social event and not presentation. It would be nice to give them swag. The only “promo material” that it’s hard for you to have is PromoDVDs (if your distro still sends DVDs). For some countries it’s hard to have PromoDVDs after the release. Order them from the marketing channels, they produce the right amount of DVDs, send them to your country. It might take you 1-2 months after the official release to have the original PromoDVDs. Although everyone can download the new version from the Internet, people like to have an original version of the DVD. Regarding Live Media, you can have some empty DVDs and the ISO files. If someone asks for a DVD, you can burn one. If someone asks for a live USB, you can also make his. 7. Social Media during the party. It sounds nasty, I know. There are people that didn’t make it to your party. They’re interested to know what’s happening. You can have ONLY one laptop (the same laptop can create the live DVD/USB). The person in charge, update your twitter, facebook, google plus with short messages (don’t forget hashtags) and also with pictures. Ask members of the community from outside your city to repost those messages (with the right hashtags). Try to keep the IRC informed as well. Another cool thing to do is a google hangout (maybe set it up with your youtube channel). This is the easiest way to have your party brodacast live. To do so, you should have a web camera (not your laptop’s) and mute your speakers (leave the mic on). You had a successful party. People MUST know about it. Write a report (even short one) at your community’s blog. Use the uploaded pictures and send the link to the channels you promoted your party (facebook, google plus, twitter, mailing lists, forums etc) and ask members of your community to repost to their blogs-social media accounts (on a different days). IMPORTANT TIP: Most of the release parties of FOSS projects attract male members. So even if a woman wants to join the party, she’s afraid or bored to come (or any other reason). So try to find women to join you, even if they don’t use Open Source. Where you can find them? At your university, ask your friends, ask your family, ask your friends to bring their girlfriends etc. They’ll come to drink a coffee or a beer and eat cake. They won’t learn how to compile code.